Technology skill and age: what will be the same 20 years from now? Is current research on computing by older adults simply looking at a short-term problem? Or will the technology problems that plague the current generation also be problematic for today’s tech-savvy younger generations when they become “old”? 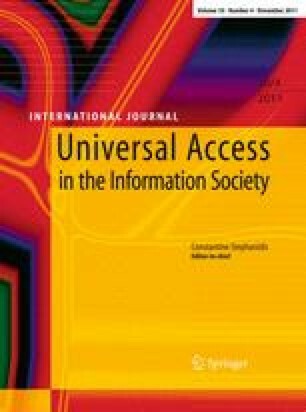 This paper considers age-related and experience-related issues that affect ability to use new technology. Without more consideration of the skills of older users, it is likely that applications and devices 20 years from now will have changed such that this “older” generation finds themselves confronting an array of technologies that they little understand and find generally inaccessible. Recent evidence suggests that older adults bring specific strengths to Web browsing. A fuller investigation of these strengths and how to design to optimize for strengths of older users has the potential to address the need for usable technology for this increasingly important demographic. An earlier version of this paper appeared in the Proceedings of the W4A Conference (Madrid, Spain, April 20–21, 2009). This writing of this paper was supported by a Royal Society Wolfson Merit Award to the author and by grants RCUK EP/G066019/1 “RCUK Hub: Inclusion in the Digital Economy” and EPSRC grant EP/H006834/1.